A DELTABEAM® is made from four steel plates welded together to allow for optimization of plate thickness. Reinforcement is also added inside the beam at the plant to achieve required fire resistance once filled with concrete. Slim Floor: Uniform thickness starting at 8 inches. Long spans over 35 feet. Integrated fire resistance of up to 4 hours. Composite Columns are made from a hollow steel section with a shop installed reinforcement cage placed inside and columns are later filled with concrete on site. 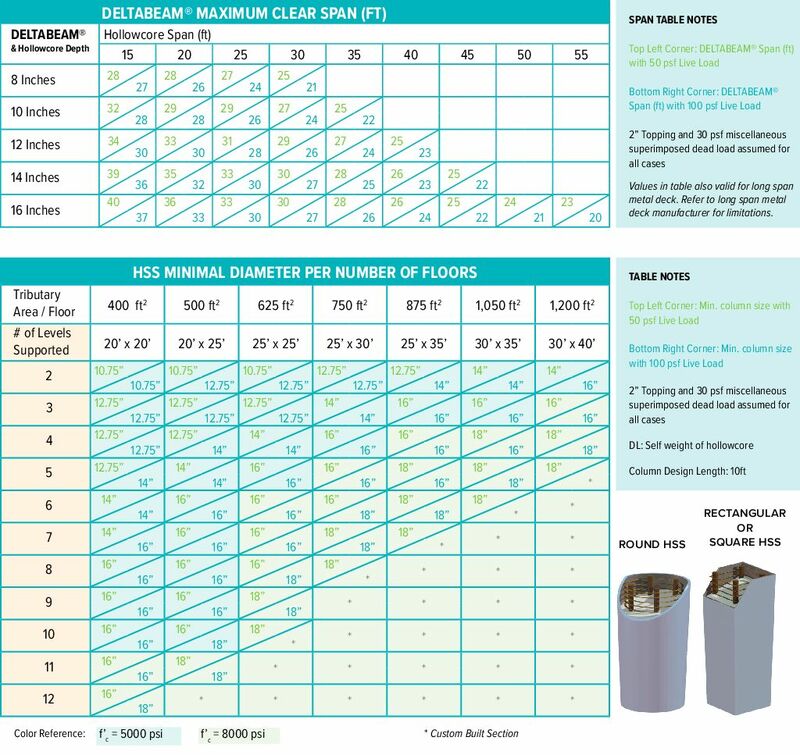 Standard HSS Profiles are available in square, rectangular and round sections. No curing time required to load the columns. Used with continuous beams for longer spans or shallower profiles. May reduce the beam price by up to 20% compared to single span beams due to the benefits of using the negative moment at the connection. Usually filled from the top. No height restrictions when using custom built HSS sections. Usually filled from the bottom. Reduces the number of components (crane picks). Maximize the number of floors or reduce the overall height for all types of buildings. Only 5 erectors are needed to put up a floor every 4 days. This includes DELTABEAM® Frame hollow-core slabs and grouting. Minimal need for shoring posts and no curing time results in quick access to trades. 1, 2, 3 and 4-hour fire ratings with no additional fire-proofing required. The composite design allows for maximum flexibility of the interior layout and a reduction in foundation costs. Allows for energy savings by reducing the overall cladding surface. DELTABEAM® Frame is made from recycled content. Eliminates conflicts with mechanical systems. DELTABEAM® Frame allows for LEED certification.